Receive articles posted on Emperor's Clothes. Please feel free to re-post articles but please quote rather than paraphrasing. Please credit the author(s) if you use our work. And please give the article's Web address so people can check the documentation. NOTE: On May 24th I spoke via three way telephone with Borislav Milosevic, Yugoslav Ambassador to Russia from 1998-2000 and before that Ambassador to Algeria. Ambassador Milosevic understands English well, hence what I said didn't have to be translated. However, the Ambassador preferred to speak Serbo-Croatian, which was kindly translated by Vladimir Krsljanin, International Secretary of the Socialist Party of Serbia. A few times Ambassador Milosevic spoke English; it is indicated in the text. Jared Israel: Mr. Ambassador it's a great honor to speak with you. For our readers, let me say that your brother, Slobodan Milosevic, has just won the Sholokhov prize, named for Mikhail Sholokhov, author of the great Russian novel, 'And Quiet Flows the Don.' Could you say a bit more about the prize? Borislav Milosevic: Yes. It is perhaps the most distinguished Russian award, given to artists and political leaders of outstanding achievement. Today at the award ceremony I accepted the prize for Slobodan Milosevic because, as the writer Yuri Bondarev said in bestowing this honor, Slobodan is being held in the dungeon of The Hague. Jared Israel: Dungeon is the word, isn't it? They don't even let him meet with Chris Black, the head of his lawyers' committee. And his living conditions are outrageous - terrible food, no exercise, no right to see his own doctors - or any heart specialist - even though his heart condition is a matter of record. And forced to be in court all day and to cross-examine witnesses virtually every day, week after week, which is unheard-of. Borislav Milosevic: I think this award will further strengthen the fighting spirit of Slobodan Milosevic and his courage as well. Jared: Also it suggests that the Russians see President Milosevic's resistance as important to their own experience. Borislav Milosevic: Yes. The greater part of Russian society strongly supports Slobodan and practically nobody approved his delivery to The Hague, not even those Rightist parties who were hostile to his government. Both houses of the Russian parliament voted overwhelmingly to condemn his kidnapping. Even the mainstream newspapers publish articles critical of The Hague. Russian people consider Slobodan Milosevic a hero of resistance to imperialist intervention, a patriot who defends his country and his people. Jared: This support from Russia is very encouraging to me. I interviewed your brother on March 23rd 2001, just before he was arrested. During that interview he said that one of the things US and West European leaders hated about Yugoslavia was the way you handled the question of national and religious group relations. There had been so much conflict in the past. Some groups had been organized by the Nazis and earlier by the Ottoman Empire to attack Serbs, and Roma and Jews as well of course - and yet in Yugoslavia, and this is still true in Serbia, you had schools in 24 different languages and court proceeding in nine languages. When I was in Serbia this past year I saw that there is still an attitude of mutual appreciation among different groups. It seems to me that the strategy of the New World Empire that has attacked you is to stir up hatred. They use the guidelines laid down by the Nazis, finding points of weakness in ethnic or religious groups that will allow the Empire's mass media and operatives to play on cultural traits that if left alone wouldn't necessarily be a problem. They stir up hatred in one culture against another in a hideous way, especially appealing to groups that were once in a dominant position, empowering their worst elements. The Empire does this more effectively than the Nazis because they have much more sophisticated mass media. Perhaps the worst thing is that the mass media romanticizes racist violence by calling it revenge. But, contrary to the media lies, (1) your government never engaged in racism. You always tried to promote fraternity. This was clear in Slobodan Milosevic's speech at Kosovo Field in 1989 (2) and before then too, despite the extremely provocative situation. Some people say Russia and Serbia are linked, that Serbia is little Russia. And so the fact that the Russian people, after what they've been through, the terrible trauma of the 1990s, the fact that they can see as their beacon this man who stands for social justice and tolerance, this gives me hope. Because there is another possible beacon - ethnic hatred, anti-Semitism, which has reared its head in Russia in the past, a Black Hundreds solution. Serbia did not abolish the autonomy of Kosovo in 1989 as some so-called experts claim. Only certain extreme and inappropriate elements of statehood were removed from what was after all a provincial government. This was done to prevent the de facto creation of a separate state in Kosovo. Jared: Which is precisely what NATO and the UN are supporting now - a separate Kosovo. Kosovo Albanians were not deprived of any human or cultural rights in 1989. The same was true of people in [the Serbian province of] Vojvodina. In fact, Kosovo Albanians continued to have cultural rights unequalled in the rest of Europe. This is clear from the leaflet which Slobodan Milosevic showed The Hague 'court' while he was cross-examining [ethnic Albanian leader] Ibrahim Rugova. The leaflet, which was signed by the KLA and Rugova, ordered ethnic Albanians to leave Kosovo during the bombing. Do you see the game they played? This demonstrates their dual purpose: creating the false appearance that Serbia was causing ethnic Albanians to suffer, so that this could be broadcast to the NATO countries, and fostering a situation within Kosovo where compromise was near impossible. This was behind everything they did, including the so-called Racak massacre and the exodus of the ethnic Albanian population during the NATO aggression. Jared Israel: And once they got the Albanians to leave, they put them in refugee camps under KLA control, with NATO's blessing. Even the Western media had stories reporting that these camps featured non-stop hate-the-Serbs-and-'Gypsies' indoctrination. Borislav Milosevic: Yet during the three months in this Hague 'court', we have seen one after another witness testify they never even heard of the Kosovo Liberation Army. Jared Israel: It would embarrass NATO. They claim they are fighting terrorism, but these people are all members - or leaders - of a terrorist group. Borislav Milosevic: Yes. It is a problem. At the very beginning of the trial it seemed as if Mr. May, whom they call 'judge,' was trying to create the impression of impartiality. But now he openly behaves as an extension of the prosecutor. He prompts and assists witnesses, allowing them every liberty including making political speeches. But he cuts off Slobodan Milosevic and does not allow him to conduct cross-examination fully or to express his opinion. This is very alarming. It creates a precedent for violating accepted legal principles including the impartiality of courts, the very basis of law. It requires the strongest international protest. This on top of the fact that Slobodan Milosevic is a head of state, overthrown by foreign money and then kidnapped by foreign agents. Who is next? Jared Israel: I think this so-called trial makes the Reichstag Fire case look good. At least Dimitrov was allowed to present his case. Borislav Milosevic: Yes, this Hague 'court' behaves like someone's instrument. Since its foundation it has been a tool of aggression against Yugoslavia. In some of my statements here in Russia I often say that the Yugoslav crisis was created in order to reorganize the whole of international relations in accordance with American interests and expansionism and it was done in a very conscious way. 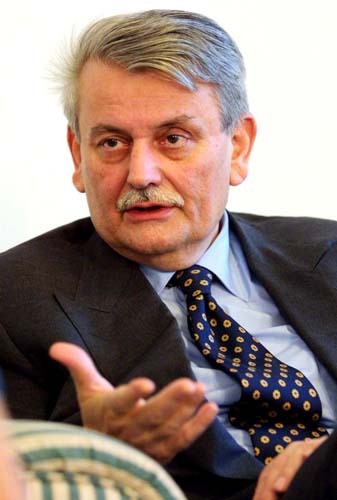 Borislav Milosevic: The aggression in Yugoslavia was an attempt to impose new International rules to justify NATO, a regional military organization, usurping the sovereign rights of countries outside its previously claimed zone of responsibility. So military and geopolitical expansion is presented as humanitarian peace making. Terrorist attacks are launched and then intervention is threatened if a country defends itself, and all this is justified by a whole new interpretation of international law so that now even the United Nations is employed to legitimize geopolitical expansion. There were in the past many other examples of violations of the UN charter: Vietnam, Granada, and so on, and this includes the sending of Russian troops to Afghanistan. However, none of these instances were sanctioned by the Security Council. In this sense, the Yugoslav case was something new, an attempt to create an international legal framework to justify the destruction of a country by terrorist forces. And what took place after Sept. 11, that is NATO's expansion into Central Asia, is a continuation. Jared Israel: You know one of the interesting things about September 11th is that here we see an Empire which has organized most of the terrorism in the world, mainly starting with Afghanistan, but they claim to be leading a crusade against terrorism. The whole strategy of the US intervention in Afghanistan, beginning in 1979, was to promote terrorism. They and the Saudis used the Wahhabi form of Islam, pouring money into the madresses which became schools training the terrorists that subsequently plagued Chechnya, Bosnia, Kosovo, Macedonia, Kashmir and I think they are in the Middle East as well. And this same terrorism which they have created - and there is a lot of indication that Mr. bin Laden is still connected with the CIA (6) although now that NATO is entrenched in Central Asia they conveniently stopped talking about him - this same terrorism which they unleash in order to destabilize areas is also used as an excuse to intervene. So it is a tool of many purposes. Very convenient and very American, because it's very American to have a tool that does two things at once. A gadget. Terrorism is a political gadget because on the one hand they can use it to attack multiethnic society as they did in Bosnia and then on the other hand they can use it as the excuse to invade, as they are now doing with Central Asia. But what shows their hypocrisy is - and you may or may not know about this - the United States is still shipping in millions of militant Islamic fundamentalist textbooks (6a) into Afghanistan. Now why on earth would they be doing this if they were sincerely fighting against Islamic fundamentalism? They just used this terrorist movement which they themselves had created as an excuse to move in. By doing these things they undermine the possibility of rational discussion because truth becomes whatever the powers-that-be and their media portray as true - it's a function of what's shown on TV. And at the same time, they reduce politics to threat and violence and then they say, "Alas, that's reality." But your brother takes ideas seriously. One of the organizations orchestrating the *anti-human* actions at The Hague is called, amazingly, Human Rights Watch. I was present the first few days of President Milosevic's 'trial' at The Hague and I got to observe Richard Dicker, a top HRW bureaucrat, in operation. Not only was he virtually the only person representing the 'Tribunal' to the press - I mean, he was Carla del Ponte's spokesman! - but both the press and 'Tribunal' officials clearly deferred to him, and he was often closeted with the prosecutors. I saw this with my own eyes. I commented to one of the senior reporters, "It looks like Dickers is running the show," and the reporter laughed and said, "Dickers *is* the show." We have several articles in preparation about HRW. Their board of directors is a Who's Who of the Imperial establishment, including Warren Zimmermann, the U.S. Ambassador who helped destroy Yugoslavia including by sponsoring Alijah Izetbegovic, the fundamentalist who devastated Bosnia (9) and George Soros who boasts that he helped his father run an extortion racket for the Nazis in Hungary during World War Two, visiting Jewish families targeted for death camps and demanding all their money in exchange for safe passage. And now he runs a privatized adjunct to the CIA. And this is *Human Rights* Watch. HRW demonizes anybody who stands up to Imperial-organized terror. When NATO sent the KLA to attack Macedonia, Human Rights Watch condemned Macedonian security troops for resisting. When I interviewed President Milosevic I asked why your government accepted defeat during the coup of 2000 instead of going to war against your opponents. He said something like, "We wanted to avoid being sucked into a civil war, which would allow NATO to intervene on the grounds that Serbs are 'hopelessly violent.' Moreover, it is easy to kill people but it isn't easy to bring them back." Despite everything that has been done to you, you resisted descending into a nightmare pit. You have upheld political discourse against this Imperial onslaught. Now one cannot say that *taking* causalities rather than hurting civilian is the same as *not* taking casualties and hurting the civilians. So all counter-terror is not terror. There are choices in the unfortunate situation of fighting terrorism as in everything. And of course saying, "counter-terrorism is state terror" has the effect of obscuring these choices and may end up justifying terrorism - because after all the terrorists are by definition no worse than the people fighting them. And this current tendency to reduce human existence to one equivalent evil, where 'humanitarian' means 'bombing' and resistance to terrorism is virtually by definition the same as terror, where it is considered natural for ethnic groups to try to kill each other and we are supposed to root for whichever side the Imperial media has portrayed as victims so that whatever they do is justified as "revenge" against whatever group has currently been labeled "just like Hitler" - that, it seems to me, is what your brother has been fighting. That is why I'm supporting him. Sorry for my long speech! Borislav Milosevic: [In English] Yes yes! No, no it's very good speech! [In Serbo-Croatian] The whole concept that your government is trying to impose on the world is very similar to what they preached when there was a bipolar world, creating a positive force and its opponent, a negative force, which today is called international terrorism; and in that struggle everything is allowed. And nobody may be neutral in that fight. So in the conditions of world supremacy of one power, the tendency for having new armaments of mass destruction, new lethal arms is increasing and it leads to development and strengthening of terrorism. International terrorism cannot be suppressed by the use of force alone, especially, as you correctly pointed out, when the supreme power is itself organizing terrorism in various ways in Kosovo, in Afghanistan, in Chechnya. So international security can be created only on the basis of universality, and not on the basis of isolation and destruction of several countries that allegedly represent some axis of evil. And you have correctly pointed out that many organizations defined as terrorist for instance and especially in the Middle East, were created and are still controlled by the American secret services. And the American policy has created great harm in other ways. There is the destruction of the environment and the economy in Yugoslavia because of the attack. And there is the increasing danger of both nuclear accident and nuclear war. Jared Israel: I think you made a very important point, that the Empire wishes to create the perception of a bipolar world, in which they are one pole and the other is terrorism. This Empire's thinkers are aware that every action has an equal and opposite reaction. Because it's a law of politics, isn't it? So opposition inevitably develops. And because they are clever, instead of only attacking the opposition, the Empire tries to mold the opposition. How can they lose if they are fighting something they control? Their own nightmare image, in effect. By declaring this war on terrorism, they are fighting forces which they covertly control. Then they also defend these terrorists, whom they actually organized, by means of the 'human rights' apparatus which they also control - and this ends up luring some people into sympathy and support for the terrorists. Such people may not be thinking clearly or maybe they've just fallen into the natural reaction that "the enemy of my enemy is my friend" - it's a human trait to think that way. So we see people on what considers itself the Left in the West making heroes out of the Taliban and other terrorists. But these terrorists are not fundamentally opponents of this Empire. The Taliban, for example, are victims of a guiding principle of this Empire, which is, "We have no friends, we only have future victims." This Empire may attack those whom it supported yesterday, as the need arises. The Taliban were supported by them (11) and then abruptly they became a target because the US needed an excuse or more properly, the Empire needed an excuse, because it is not the same as the US, this Empire is above the US government, the Empire needed an excuse to move into Central Asia. This was for geopolitical reasons. They wanted to give Central Asian nations the DOS (12) treatment, which is penetration by Fifth Column organizations, and we see this now going on in Central Asia accompanied by military penetration and the corruption of the remnants of the Soviet officer corps disguised as military aid and training. The goal is to build a force in these countries capable of striking Russia. The Empire knows that Russia, in alliance with China, is the primary real threat to their control. So this move to complete the encirclement of Russia is justified by the "war against Terrorism." And so some people in the peace movement, perhaps not giving enough thought to what's going on, but simply reacting to the appearance, which is that the Empire is attacking Islamic fundamentalist terrorists - some people conclude that the fundamentalists are an ally in resisting NATO. Meanwhile, in fact, huge numbers of Taliban are being incorporated into the new Afghan army (14) which is still a Fundamentalist army, just more directly under Imperial control and with an end to local squabbling, or so they hope. When Russia was the opposite pole, that was a problem. Russia had positive ideas and practices regarding social equality. It was weak on democracy and sometimes on international morality but strong on social equality, and this encouraged dangerous egalitarianism. But with Islamic terrorists as the opposite pole, when potential opponents are drawn to the opposite pole, what are they idolizing? The most backward and fascistic forces - the very people Saudi Arabia and US used to destroy the secular state in Afghanistan. So these jihad terrorists, the most brutal killers, who condone violence against women, whose definition of democracy is enforcing the Quran, who advocate religious war - these fanatics become the heroes for kids who want to change the world. What a nightmare. Borislav Milosevic: It is a difficult situation. Regarding this, let me say something about the war on terror. We in Yugoslavia consider September 11th a tragic event. But we take no satisfaction regarding Sept. 11. On the contrary, we sympathize with those who have suffered in the US. It is understandable that people in your country would have strong reactions when those terrible events happened last September. But now time has passed. A more thoughtful approach may be taken. A road of peace may be pursued. I hope that people in your country will think deeply about these questions. It is very important to the world. Jared Israel: Thank you, Mr. Ambassador. Borislav Milosevic: [In English] OK, Israel. It was very very big pleasure for me and I am very pleased to contact to you like this and thank you very much. Very big pleasure for me. Jared Israel: Well, thank your mother and father for having produced two men who have contributed so much to the world. Milosevic [Laughs. Says in English]: Don't overestimate things. Jared Israel: But it's the truth. Where would we be without Serbia? You resisted. What can I say? The Serbs seem to do it every time. Ms. Johnstone's article is generally instructive in seeing through the dark glass of misinformation about Yugoslavia. 5) "Afghan Operation Leaves Russia 'Encircled' by US and NATO,"
10) 'The Other Side of the Story,' by Dusan Vilic and Bosko Todorovic. Emperor's Clothes has only one source of income - your donations. We want everyone to read our articles, whether they can afford to contribute money or not. But if you can contribute, please do; we are only able to continue based on your help. You Can Be an Emperor's Clothes Sponsor! Help Emperor's Clothes grow! You can automatically contribute any sum you wish via credit card once a month. In this way you will help put Emperor's Clothes on a more reliable financial basis. To become a Sponsor, write emperors1000@aol.com and we'll contact you Thanks!